Please Note: Flights to and from the Galápagos Islands & Internal flights are included. 4 lower deck double-occupancy cabins with port hole, air conditioning, private facilities, TV & DVD player in lounge area. 4 upper deck double-occupancy cabins with window, air conditioning, private facilities, TV & DVD player in lounge area. Day 3Chinese Hat/Black Turtle Cove Visit Chinese Hat for snorkelling opportunities and to observe the birds and sea lions before taking an excursion to Black Turtle Cove to see the marine life. Cross two more passes and ruins on today's trek. The first pass is Runquraqay at 3,950m (13,113 ft) where, on a clear day, hikers can catch a glimpse of the snow-capped Cordillera Vilcabamba. Hike through the cloud forest on a gentle climb to the second pass of the day, walking through original Incan constructions. The highest point of the pass is 3,700m (12,136 ft). On a clear day, enjoy the spectacular views of the Urubamba Valley. At 3,650m (11,972 ft), reach the ruins of Phuyupatamarca, the "town above the clouds." Camp here or go another 1.5 hrs to the Wiñay Wayna ruins ("forever young") located at 2,650m (8,694 ft). When it comes to our stellar fleet of Galápagos vessels, the Xavier III is made for both great value and great service. Imagine all the luxury of fresh gourmet food, daily excursions to explore the islands, and picturesque views of the area from the top deck – all this with an unbelievable price to boot. Cabins: Eight twin-occupancy cabins with private bathrooms and A/C. All cabins feature side by side berths located on the upper or lower deck. Boat layout: Main deck features the lounge, bar and dining room with coffee station. A deck above is the Sundeck and Upper deck cabins. Interior lounge on main deck with TV & DVD player for daily briefings and presentations. 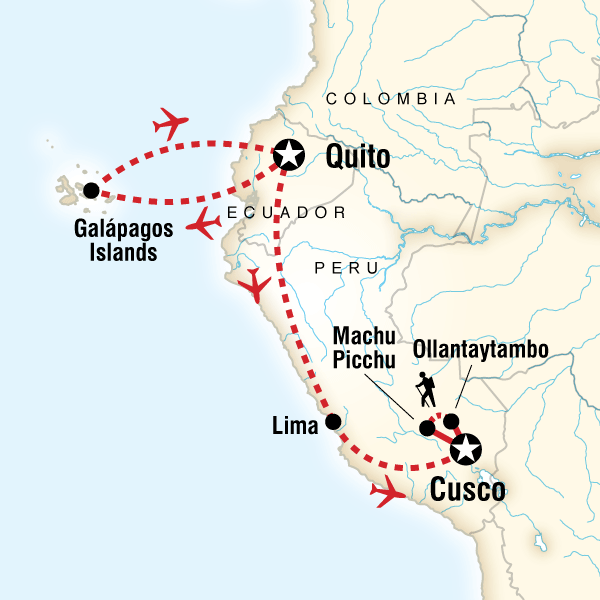 Explore Peru's southern coast, its Incan Highlands and the Galápagos Islands. From the soaring heights of the Inca Trail to the steamy jungle stay at the exclusive G Lodge Amazon, ......click here to read more. Encounter the island chain that has enchanted explorers since Darwin first weighed anchor off its shores. Spend seven nights exploring the incredible wildlife of the Galápagos archipelago in the company ......click here to read more.